The second coming of the war for late night is, uh, coming—Jimmy Fallon may be the current ratings king over at The Tonight Show, but he’s in for a fight once The Late Show With Stephen Colbert premieres next week. We know there are other network talk show hosts—and hey, even some on cable—but it’s pretty clear that Fallon and Colbert are the frontrunners. Although Colbert recently said he just wants to make variety-show love and not late-night war, we still have time to kill before fall TV premieres, so we’re going to make a big deal about Vice President Joe Biden being one of his first guests. Just hours after The Tonight Show announced that Queens-born Oompa Loompa Donald Trump would be a guest on the September 11th show, The Late Show shared the news that Joe Biden would appear on its September 10th episode. 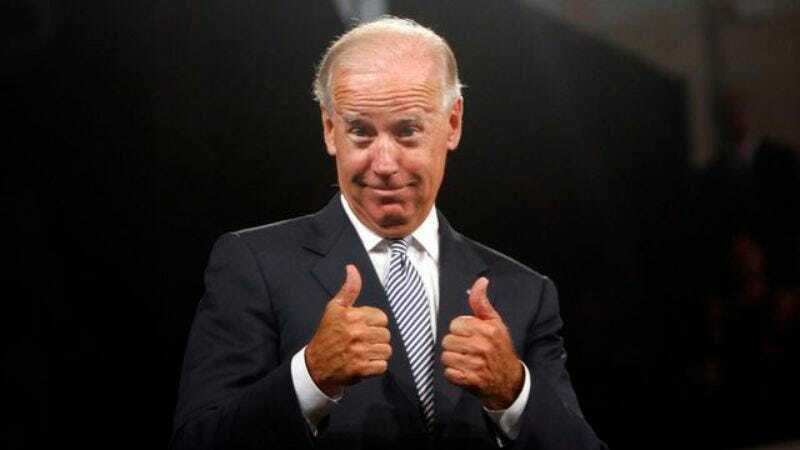 The Wrap and other outlets covered the Biden news along with the Trump talk yesterday. We’re a little late to the game, but we were just verifying exactly which Joe Biden will join Colbert at the famed Ed Sullivan Theater. There is, after all, this guy. We know it’s probably just a coincidence that Colbert would have a Democrat (and potential presidential candidate) on his show the same week that Trump, who last month became persona non grata at NBC, returns to his former network. And anyway, the first politician to appear on The Late Show will be presidential hopeful Jeb Bush, who’s a Republican. So this so-called “war” could just turn out to be a water-cooler skirmish. Vice President Biden will be joined in combat—or conversation—on September 10 by Uber CEO Travis Kalanick and uber-American Toby Keith. There’s some speculation that he’ll take the opportunity of being on national television to announce his presidential bid, but he might just want to talk about his latest government appointee.